1 My heart seethes [with] goodly speech: I speak my work (poem) to a king: My tongue is the pen of a swift scribe. 2 Thou art fair beyond the sons of men; Grace is poured on thy lips: Therefore God has blessed thee for ever. 3 Gird thy sword on thy thigh, O hero, Thy splendour and thy majesty. 4 [And [in] thy majesty] press forward, ride on, For the help of truth, and meekness-righteousness: And thy right hand shall teach thee awe-striking deeds. 5 Thine arrows are keen-- The peoples fall under thee-- Into the heart of the enemies of the king. 7 A sceptre of uprightness is the sceptre of thy kingdom. Thou lovest righteousness, and hatest iniquity: Therefore God, thy God, has anointed thee With the oil of gladness above thy fellows. 8 Myrrh and aloes [and] cassia [are] all thy robes; Out of palaces of ivory, stringed instruments make thee glad. 9 Kings' daughters are among thy favourites: The consort stands at thy right hand in Ophir gold. 11 So shall the king desire thy beauty: For he is thy lord; and bow thou down to him. 12 And the daughter of Tyre [shall come] with a gift; The richest among the peoples shall seek thy favour. 13 All glorious is the king's daughter in the inner palace: Of cloth of gold is her garment. 14 In embroidered robes is she led to the king: Maidens behind her, her friends, are brought to thee. 15 They are brought with gladness and exultation: They enter into the palace of the king. 16 Instead of thy fathers shall be thy children: Thou wilt make them princes in all the earth. 17 I will commemorate thy name through generation after generation: Therefore shall the peoples praise thee for ever and aye. This is an epithalamion or ode on a king's marriage. The usual bewildering variety of conjectures as to his identity meets us in commentaries. The older opinion points to Solomon's marriage to an Egyptian princess, to which it is objected that he was not a warrior king, as the monarch of the psalm is. Hitzig regards "daughter of Tyre," in ver. 12, as a vocative, and therefore looks for a king who married a Tyrian woman. He is obliged to go to the northern kingdom to find one, and pitches on Ahab, because Jezebel was the daughter of "a king of the Zidonians," and Ahab had an "ivory house" (1 Kings xxii. 39). It is hard to believe that that wedded pair of evil memory are the originals of the lovely portraits in the psalm, or that a psalmist would recognise the kingdom of Israel as divinely established and to be eternally upheld. Besides, the construction of ver. 12, on which this theory pivots, is doubtful, and the daughter of Tyre there mentioned is more probably one of the bringers of gifts to the bride. The attributes of the king and the promises for his descendants cannot be extended, without incongruity, beyond the Davidic line. Hence Delitzsch has selected Jehoram, the son of Jehoshaphat, principally because his wife, Athaliah, was of Tyrian descent, being Jezebel's daughter, and partly because his father had been a trader, which accounts for the allusions to gold of Ophir and ivory. These are slender grounds of identification, to say nothing of the miserable contrast which Jehoram's reign--a dreary record of apostasy and defeat, culminating in a tragic death and a dishonoured grave (2 Chron. xxi.) --would present to the psalm. Some commentators have thought of the marriage of a Persian king, mainly because the peculiar word for consort in ver. 9 is employed for Persian queens (Neh. ii. 6), and also because the Tyrians were tributary to Persia, and because the sons of the king are to be "called princes in all lands," which reminds us of Persian satraps. Ewald finally fixed on Jeroboam II. of Israel. Cheyne ("Orig. of Psalt.") finds the king of the psalm in Ptolemy Philadelphus, the inspirer, as was believed, of the LXX. translation, whom Josephus and Philo extol. Its author puts this identification only as "tentative." Notwithstanding his anticipatory protest against making Philadelphus' moral character an objection, he feels that it is an objection; for he urges that its darker shades had not yet disclosed themselves, and confesses that "a haze of illusion encompassed our poet," who "overrated this Ptolemy, from taking too external a view of the Messianic promise, and being flattered by a Hellenic king's partiality for his people" (u.s., 172). Philadelphus afterwards married his sister. His hands were red with blood. Was a Jewish psalmist likely to take "up the singing robes of a court poet" (u.s.) in honour of a Ptolemy, or to transfer the promises to the Davidic line to, and to speak of God as the God of, a foreign king? Or how, if he did, came his song to find and keep a place in the Psalter? All these conjectures show the hopelessness of identifying the person intended addressed in the psalm. It is said that a knowledge of the historical allusions in the Psalter is indispensable to enjoying it. They would often be helpful if they could be settled, but that is no reason for elevating conjecture to the place of knowledge. One reason for the failure of attempts at identification is that the language is a world too wide for the best and greatest of Jewish kings. Much in the psalm applies to a historical occasion, the marriage of some monarch; but there is much that as obviously goes beyond it. Either, then, the psalm is hyperbole, outstripping even poetical licence, or there appear in it characteristics of the ideal monarch whom the psalmist knew to be promised to Israel. Every king of Judah by descent and office was a living prophecy. The singer sees the Messiah shining, as it were, through the shadowy form of the earthly king, whose limitations and defects, no less than his excellences and glories, pointed onwards to a greater than Solomon, in whom the "sure mercies" promised to David should be facts at last. 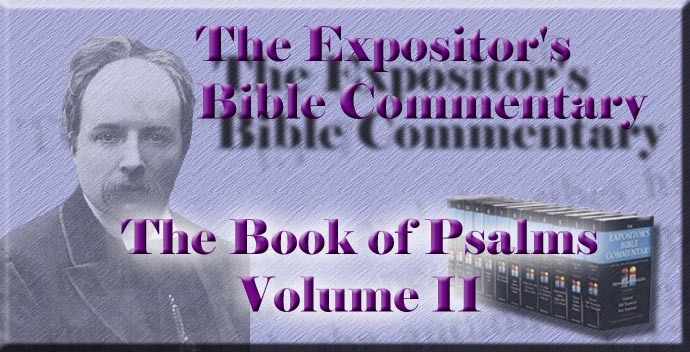 The psalm has two main divisions, prefaced by a prelude (ver. 1), and followed by prediction of happy issue of the marriage and enduring and wide dominion. The two main parts are respectively addressed to the royal bridegroom (vv. 2-9) and to the bride (vv. 10-15). The singer lays claim to at least poetic inspiration. His heart is seething or boiling over with goodly words, or perhaps with the joyful matter which occasions his song--namely, the royal nuptials. He dedicates his "work" (like the original meaning of "poem"--a thing made) to "a king," the absence of the definite article suggesting that the office is more prominent than the person. He sings to a king; therefore his strains must be lofty. So full is his heart that the swift words pour out as the stylus of a rapid writer races over the parchment. The previous musing has been long, the fire has burned slowly; but at last all is molten, and rushes out, fluent because fervent. The picture of the king begins with two features on which the old-world ideal of a monarch laid stress--personal beauty and gracious speech. This monarch is fairer than the sons of men. The note of superhuman excellence is struck at the outset; and though the surface reference is only to physical beauty, that is conceived of as the indication of a fair nature which moulds the fair form. The highest truth of this opening word is realised only in Him of whom it was also said, in apparent contradiction, but real harmony with it, "His visage was so marred more than any man, and His form more than the sons of men." The craving for "whatsoever things are lovely," like all other desires, has for its object Jesus Christ. Another kingly excellence is sweet courtesy of speech. Possibly, indeed, the "grace poured on the lips" may mean the gracious smile which moulds their curves, but more likely it refers to the kindly speech that so well become a mouth that can command. The sweetest examples of such words are poor beside "the gracious words that proceeded out of His mouth." The psalmist's ideal is that of a gentle king. Where else than in the King whose sceptre was a reed, not an iron rod, has it been fulfilled? Than is the smile upon Thy face." From such characteristics the psalmist draws an inference--"therefore God hath blessed thee for ever"; for that "therefore" does not introduce the result of the preceding excellences, but the cause of them. The psalmist knows that God has blessed the king because he sees these beauties. They are the visible signs and tokens of the Divine benediction. In its reference to Christ, the thought expressed is that His superhuman beauty is to all men the proof of a unique operation of God. Abiding divinity is witnessed by perfect humanity. The scene changes with startling suddenness to the fury of battle. In a burst of lyric enthusiasm, forgetting for a moment nuptials and wedding marches, the singer calls on the king to array himself for war and to rush on the foe. Very striking is this combination of gentleness and warrior strength--a union which has been often realised in heroic figures, which is needful for the highest type of either, and which is fulfilled in the Lamb of God, who is the Lion of the tribe of Judah. The king is to gird on his sword, and to array himself, as in glittering armour, in his splendour and majesty, and, thus arrayed, to mount his chariot, or, less probably, to bestride his war-horse, and hurl himself on the yielding ranks of the enemy. "Press forward, drive (or ride) on," crushing obstacles and forcing a path. But Israel's king could be no vulgar conqueror, impelled by lust of dominion or "glory." His sword is to be girt on for the help or "on behalf of truth, meekness, and righteousness." These abstracts may be used for concretes--namely, the possessors of the qualities named. But the limitation is not necessary. The monarch's warfare is for the spread of these. The Hebrew binds the two latter closely together by an anomalous construction, which may be represented by connecting the two words with a hyphen. They are regarded as a double star. Then follows a verse of hurry: "Thy right hand shall teach thee awe-striking deeds." He has no allies. The canvas has no room for soldiers. The picture is like the Assyrian sculptures, in which the king stands erect and alone in his chariot, a giant in comparison with the tiny figures beneath him. Like Rameses in Pentaur's great battle-song, "he pierced the line of the foe; . . . he was all alone, no other with him." Then follow three abrupt clauses, reflecting in their fragmentary character the stress of battle: "Thine arrows are sharp--The peoples fall under thee--In the heart of the enemies of the king." The bright arrow is on the string; it whizzes; the plain is strewed with prostrate forms, the king's shaft in the heart of each. It is no mere fanciful spiritualising which sees in this picture an adumbration of the merciful warfare of Christ all through the ages. We get to the kernel of the history of Israel when we regard it as the preparation for Christ. We understand the raison d'être of its monarchy when we see in these poor shadows the types of the King of men, who was to be all that they should have been and were not. The world-wide conflict for truth and meekness and righteousness is His conflict, and the help which is done on earth He doeth it all Himself. The psalm waits for its completion still, and will wait until the day when the marriage supper of the Lamb is preceded by the last battle and crowning victory of Him who "in righteousness doth judge and make war." All the older versions take "God," in ver. 6 a, as a vocative, while most moderns seek another construction or text. "The sum of the matter is that the only natural rendering of the received text is that of the Versions, 'Thy throne, O God'" (Cheyne, in loc.). Three renderings have been proposed, all of which are harsh. "Thy throne is the throne of God," etc., is Ewald's suggestion, revived from a Jewish expositor, and adopted widely by many recent commentators, and in the margin of the R.V. It is clumsy, and leaves it doubtful whether the stress of the assertion lies on the Divine appointment or on the eternal duration of the throne. "Thy God's throne is," etc., is very questionable grammatically, and extremely harsh. The only other suggested rendering, "Thy throne is God," etc., may fairly be pronounced impossible. If the vocative construction is retained, are we shut up to Cheyne's further opinion, that "the only natural interpretation [is] that of the Targum, 'Thy throne, O Jehovah'"? If so, we shall be obliged to admit textual corruption; for a reference to the eternal duration of Jehovah's dominion is quite out of place here, where the parallelism of the next clause demands some characteristic of the king's throne corresponding to that of his sceptre, there stated. But in Exod. xxi. 6, xxii. 8, and Psalm lxxxii. 6, the name God (Elohim) is applied to rulers and judges, on the ground, as our Lord puts it, in John x. 35, that "unto them the word of God came"--i.e., that they were theocratic officers. The designation, therefore, of the king as Elohim is not contrary to the Hebrew line of thought. It does not predicate divinity, but Divine preparation for and appointment to office. The recurrence of Elohim (God) in its full Divine signification in the next verse is felt by many to be an insuperable objection to recognising the lower sense here. But the emphatic "thy God," which is appended to the name in ver. 7, seems expressly intended to distinguish between the uses of the word in the two verses. August, then, as the title is, it proves nothing as to the divinity of the person addressed. We recognise the prophetic character of the psalm, and strongly believe that it points onwards to Christ the King. But we cannot take the ascription of the title "O God" as having reference to His Divine nature. Such a thought lay far beyond the prophetic horizon. The Old Testament usage, which is appealed to in order to justify the translation of the word "God" as a vocative, must govern its meaning. The careful distinction drawn by the expressions of ver. 7, between the lower and higher senses of the name, forbid the attempt to find here a premature and anomalous statement of deep truth, for which the ages were not ripe. While we, who know the full truth, may permissibly apply the psalmist's words as its expression, we must not forget that in so doing we are going beyond their real meaning. The controversies waged over the construction of this verse have sometimes been embittered by the supposition that it was a buttress for the truth of Christ's Divine nature. But that is a mistake. The psalm goes no further than to declare that the king is divinely endowed and appointed. It does outline a character fairer than the sons of men, which requires indwelling Deity for its realisation in humanity. But it does not speak the decisive word, which alone could solve the mystery of its requirement, by proclaiming the fact of incarnation. The perpetuity of the king's throne is guaranteed, not only by his theocratic appointment by God, but by the righteousness of his rule. His sceptre is not a rod of iron, but "a sceptre of uprightness." He is righteous in character as well as in official acts. He "loves righteousness," and therefore cannot but "hate iniquity." His broad shield shelters all who love and seek after righteousness, and he wars against evil wherever it shows itself. Therefore his throne stands firm, and is the world's hope. A singer who had grasped the truth that power divorced from justice could not endure was far in advance of his time. The nations have not yet learned his lesson. The vast robber-kingdoms which seemed to give the lie to his faith have confirmed it by their evanescence. The king's love of righteousness leads to his being "anointed with the oil of gladness above his fellows." This anointing is not that of a coronation, but that of a feast. His "fellows" may either be other kings or his attendant companions at his marriage. The psalmist looks as deep into individual life as he has just done into politics, and ascribes to righteousness lofty powers in that region too. The heart which loves it will be joyful, whatever befalls. Conformity to the highest ideal known to a man, or, at all events, hearty love thereof, leading to efforts after it, is the surest foundation for lasting and deep joy. Since Christ is the fulfilment of the psalmist's picture, and perfectly realised the perfection of manhood, the psalmist's words here are most fully applicable to Him. True, He was "a man of sorrows," but beneath His sorrow had abiding and central joy, which He bequeathed to us, with the assurance that to possess it would make our joy full. His pure manhood was ever in touch with God, and lived in conscious righteousness, and therefore there was ever light within, though there was darkness around. He, the saddest, was likewise the gladdest of men, and "anointed with the oil of joy above His fellows." In ver. 8 the Psalm reaches its main theme--the marriage of the king. The previous verses have painted his grace of person, his heroic deeds in battle, and his righteous rule. Now he stands ready to pass into the palace to meet his bride. His festival robes are so redolent of perfumes that they seem to be composed of nothing but woven fragrance. There are difficulties in the rendering of ver. 8 a, but that adopted above is generally accepted as the most probable. The clause then describes the burst of jubilant music which welcomed and rejoiced the king as he approached the "palaces of ivory," where his bride waited his coming. Ver. 9 carries the king into his harem. The inferior wives are of royal blood, but nearest him and superior to these is the queen-consort glittering with golden ornaments. This feature of the psalmist's description can only have reference to the actual historical occasion of the psalm, and warns against overlooking that in seeking a prophetic reference to the Christ in every particular. The second half of the psalm is an address to the bride and a description of her beauty and state. The singer assumes a fatherly tone, speaking to her as "daughter." She is a foreigner by birth, and is called upon to give up all her former associations, with whole-hearted consecration to her new duties. It is difficult to imagine Jezebel or Athaliah as the recipient of these counsels, nor does it seem to the present writer to add anything to the enjoyment of the psalm that the person to whom they were addressed should be identified. The exhortation to give up all for love's sake goes to the heart of the sacred relation of husband and wife, and witnesses to the lofty ideal of that relation which prevailed in Israel, even though polygamy was not forbidden. The sweet necessity of wedded love subordinates all other love, as a deeper well, when sunk, draws the surface waters and shallower springs into itself. The king sung of in the psalm was a type of Christ. Every true marriage is in the same fashion a type of the union of the soul with Jesus, the lover of all, the bridegroom of humanity. So it is not arbitrary spiritualising, but recognition of the nobleness of the lower love and of its essential similarity with the highest, when the counsel to this bride is regarded as shadowing the duties of the soul wedded to Christ. If a heart is really influenced by love to Him, that love will make self-surrender blessed. A child gladly drops toys when it stretches out its little hand for better gifts. If we are joined to Jesus, we shall not be unwilling to "count all things but loss for the excellency of the knowledge" of Him. Have the terms of wedded life changed since this psalm was written? Have the terms of Christian living altered since it was said, "Whosoever he be of you that forsaketh not all that he hath, he cannot be My disciple"? The law still remains, "Daughter, forget thine own people and Thy father's house." The exhortation is followed by a promise: "So shall the king desire thy beauty." The application of these words to the relations of Christ and His people carries with it a striking thought that He is affected by the completeness of our self-surrender and dependence. He pours love on the unworthy, but that is a different thing from the love with which He responds to such abandonment of self and other loves. Holy, noble living will bring a smile into His face and draw Him nearer to us. But whilst there is all this sweet commerce of love and giving, the bride is reminded that the king is her lord, and is to be reverenced as well as loved. There is here, no doubt, the influence of an archaic mode of regarding marriage and the wife's position. But it still is true that no woman finds all that her heart needs in her husband, unless she can bring her reverence where she has brought her love; and that love will not long remain if reverence departs. Nor is the warning less needed in the higher region of the wedlock of the soul with the Saviour. Some types of emotional religion have more to say about love than about obedience. They are full of half-wholesome apostrophes to a "dear Lord," and are apt to forget the last word in the emphasis which they put on the first. The beggar-maid married to a king was full of reverence as well as love; and the souls whom Jesus stoops to love and wash and wed are never to forget to blend adoration with approach and obedience with love. A picture of the reflected honour and influence of the bride follows in ver. 12. When she stands by the king's side, those around recognise her dignity, and seek to secure her favour. Hupfeld, Hitzig, and others take "daughter of Tyre" to be a vocative, addressed to the bride, who is, according to their view, a Tyrian princess. But there is a strong grammatical objection to that construction in the copula ("and") prefixed to "daughter," which is never so prefixed to a vocative unless preceded by another vocative. Delitzsch, Baethgen, Perowne, and Cheyne agree in recognising the force of that consideration, and the three former regard the phrase not as a vocative, but as a nominative. It is a personification of the Tyrians according to a familiar idiom. The clause is elliptical, and has to be supplemented by supposing that the same verb, which appears in the next clause in the plural, is to be supplied in thought, just as that clause requires the supplement of "with a gift" from this one. There appears to be some flaw in the text, as the clauses are unsymmetrical, and possibly the punctuators have marked a hiatus by the sign (Pasek) after the word "daughter of Tyre." To "seek thy favour" is literally to "smooth thy face"--a graphic representation. In the highest region, which we regard the psalm as adumbrating, the words have fulfilment. The bride standing by her bridegroom, and showing her love and devotion by self-abandonment and reverence, will be glorious in the eyes of those around. They who manifestly live in loving communion with their Lord will be recognised for what they are, and, though sometimes hated therefor, will also be honoured. When the Church has cast all but Christ out of its heart, it will conquer the world. "The sons of them that afflicted thee shall come bending unto thee." In vv. 13-15 the bride's apparel and nuptial procession are described. She is "all glorious within,"--by which is not meant, as ordinarily supposed, that she possesses an inner beauty of soul, but that the poet conceives of her as standing in the inner chamber, where she has been arrayed in her splendour. Krochmal, followed by Graetz and Cheyne, changes the text so as to read corals, or, as Cheyne renders, pearls (Heb. p'ninim), for within (p'ninah), and thus preserves unity of subject in the verse by removing the local designation. But the existing reading is intelligible. In ver. 14 the marriage procession is described. The words rendered "embroidered robes" are by some taken to mean "tapestry of divers colours" (Perowne), or richly woven carpets spread for the bride to walk on, and by others (Hitzig, Riehm) gay-coloured cushions, to which she is led in order to sit beside the bridegroom. But the word means apparel elsewhere, and either of the other meanings introduces an irrelevant detail of another kind into the picture. The analogy of other Scripture metaphors leads at once to interpreting the bride's attire as symbolic of the purity of character belonging to the Church. The Apocalypse dresses "the Lamb's wife" in "fine linen, clean and white." The psalm arrays her in garments gleaming with gold, which symbolise splendour and glory, and in embroidered robes, which suggest the patient use of the slow needle, and the variegated harmony of colour attained at last. There is no marriage between Christ and the soul, unless it is robed in the beauty of righteousness and manifold graces of character. In other places we read that the bride "made herself ready," and also that "to her was granted that she should be arrayed in fine linen, clean and white," in which sayings are set forth the double sources of such a garment of the soul. It is a gift from above. It is "put on" by continual effort, based on faith. The picture of the home-coming of the bride follows. She is attended by her maidens, and with them she passes into the palace amid joys and exultation. The psalm stops at the threshold. It is not for the singer to draw back the curtains and let in the day. "The door was shut." The presence of virgin companions waiting on the bride no more interferes with the application of the psalm to Christ and His Church than the similar representation brings confusion into our Lord's parable of the Ten Virgins. Parables and symbols are elastic, and often duplicate their representations of the same thing; and such is the case here. The closing verses are addressed, not to the bride, but to the king, and can only in a very modified way and partially be supposed to pass beyond the Jewish monarch and refer to the true King. Hopes that he might be blessed with fortunate issue of the marriage were quite in place in an epithalamion, and the delicacy of the light touch with which this closing note is struck is noteworthy, especially in contrast with the tone of many famous secular songs of similar import. But much straining is needed to extract a spiritual sense from the words. Perowne truly says that it is "wiser to acknowledge at once the mixed character" of the psalm, and he quotes a sagacious saying of Calvin's to the effect that it is not necessary that every detail should be carefully fitted to Christ. The psalm had a historical basis; and it has also a prophetic meaning, because the king of Israel was himself a type, and Jesus Christ is the fulfilment of the ideal never realised by its successive occupants. Both views of its nature must be kept in view in its interpretation; and it need cause no surprise if, at some points, the rind of prose fact is, so to speak, thicker than at others, or if certain features absolutely refuse to lend themselves to the spiritual interpretation.